Abstract. We are witnessing the emerging study of business models through sociological lenses. Such research has been conducted, for instance, through the lenses of economic sociology, organizational institutionalism, and theories of practice. This brief positioning paper provides an overview of emergent discussions and suggests promising future discussions. 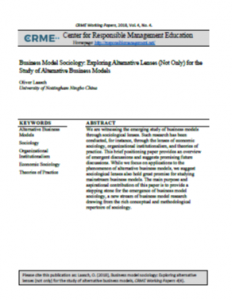 While we focus on applications to the phenomenon of alternative business models, we suggest sociological lenses also hold great promise for studying mainstream business models. The main purpose and aspirational contribution of this paper is to provide a stepping stone for the emergence of business model sociology, a new stream of business model research drawing from the rich conceptual and methodological repertoire of sociology.